In 1987 the first lnternational Conference on the Management of Chronic Respiratory Failure was held in Veruno (ltaly), thirthy three years and 8 Conferences later much has changed, not only in regard to the organization of the Conference itself, but also the problems arising from chronic respiratory diseases have changed. Chronic respiratory diseases are among the most important causes of death in our society and their burden is constantly increasing. Over the last 20 years effective technical and pharmacological aids nave been added to the tool-box of the chest physician, improving the life of patients both in terms of expectancy and quality. Obviously, this development of chest medicine has also had important repercussions on health resources consumption and currently there is a widespread debate on how to cope with the growing burden. The International Conference on “Management and Rehabilitation of Chronic Respiratory Failure” - now in its 9th edition - is recognized as a key international scientific event in this specific field. 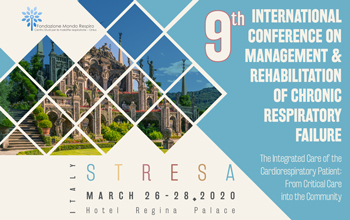 The 2020 edition, which will be held in Stresa (Italy), will deal with new developments in respiratory medicine in the integrated care of the cardiorespiratory patient, focusing on the transition from critical care into the community, with particular attention to the possibilities of integration between specialists and primary care medicine. - integrating medical care among health care professionals and across the health care sector. Optimal integration of medical care for COPD is still in its infancy, and its implementation will undoubtedly represent a paradigm shift in our thinking. In particular, the scientific program will describe in detail the specific components of disease management that apply to the complex chronic respiratory patient in the transition from critical care into the community, providing innovative examples programs originating from different health care systems. Our wish is that the commitment manifested by the Scientific and Organizing Committees - in their respective areas of competence - combined with the work of speakers, key opinion leaders in their specific field, will lead to a fruitful exchange of opinions among participants enabling us to realize that particular “mix” that will make this a unique scientific event.